Say hello to my new beauty box full of summer goodies. At last, summer is here and holiday season is nearly upon us. I ordered my first beauty box from Latest In Beauty last August and was chuffed with everything in it. I love Latest in Beauty as there's no monthly subscription involved, you just buy as and when the mood takes you. L'Occitane shampoo & conditioner: Let's start with showing you these little beauties shall we from a brand we all know and love. I've only used these once so far but I'm impressed. My hair is very fine and prone to quite a bit of breakage but these seemed to really nourish my hair making it soft and really glossy. They have 5 different essential oils packed in and the smell is heavenly. They're great travel sizes too. Balance me body polish: This body polish combines an exfoliator with lovely oils to soften the skin, lavender is the one that jumps out at me. It claims to be a 'tone enhancing', anti-oxidant rich body polish with walnut shells, tiny micro beads obviously, not giant walnuts, designed to firm, plump and smooth all in one and offers a mini workout each time you use it. Yeah, you heard me right. I get a mini workout each time I exfoliate in my tiny shower cubicle, bending and twisting like a contortionist each time I exfoliate, but I don't think thats what they mean. Put visions in your head now haven't I? Anyway, exfoliate, yep, tone and mini workout? Doubtful. Hell, if it does I can stop taking my wobbly thighs to the gym! Vita Liberata Minerals: this self tanning bronzer is said to be one of the most exciting beauty launches of the year. You basically dust the powder across your face for a natural looking tan that will then develop and last for up to five days. I'm to be honest here though and say I've not used it yet. I'm scared to! I like a good self tanning product as much as the next woman but I like to know where I'm putting it exactly and with this I worry by just brushing it over your face it'll end up quite patchy. Hmmm.......just. not. sure. Emily has volunteered to test it so watch this space. 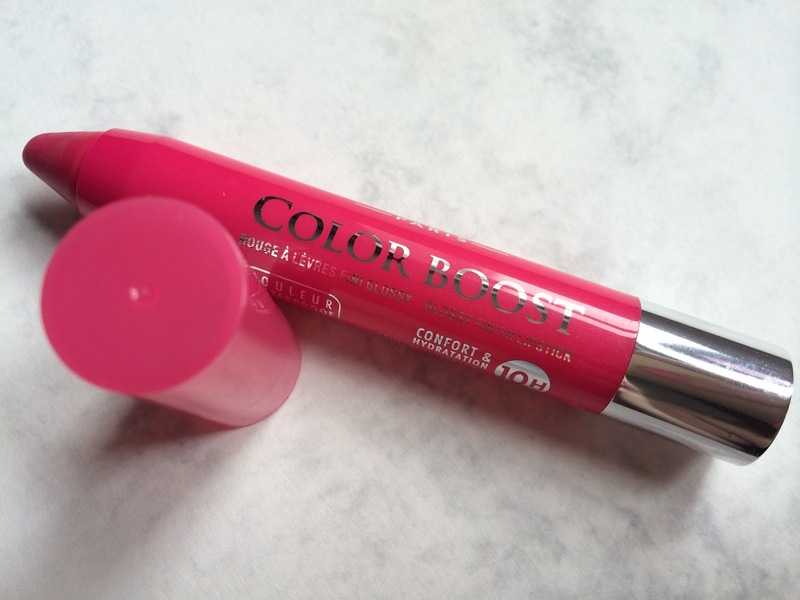 Bourjois colour boost lip crayon: Now this is lovely, a lip crayon would often be my choice over a lipstick (dry lips syndrome) and I like this chunky one. The colour glides on really easily and does stay put for a good while. It's supposed to offer comfort, hydration for up to 10 hours, and be waterproof! Comfort, yes, I can confirm, but the staying power for 10 hours I can't and I haven't swam in it yet. What am I on about, I never will as I don't put my head under water for anyone! In the box you got one of three shades and I would have preferred the middle shade which looks more like a pale pink as this one is a little bright for me. Nails Inc gel effect polish: I love this colour. Again there were three colour options and this is the one I wanted for summer. It's a gorgeous bright coral shade. I don't know about you but the minute I get a new nail colour I have to put it on straight away. It claims to be ultra-glossy, extra shiny and long lasting. The gel effect glossiness is in fact fantastic but it just didn't last on my sadly, it had chipped within two days and I've not re-applied. Eucerin sun care: In my box I got the sun creme for the face with a SPF50. Fortunately we had a bit of sunshine of late so I did try this out, I know, I know, you're all shouting at your screen right now telling me I should wear it everyday and not just when the sun is out but I'm getting better I promise. This doesn't leave your face greasy at all, was really easy to apply and makeup went on smoothly afterwards. Mr C even used it on a scorchingly hot day at Silverstone recently and it gave him really good protection. I don't think this is something I would repurchase for a couple of reasons. Firstly I look for sunscreen with a five star UVA rating, not just the UVB and this is four star for the UVA. Secondly I like a facial sunscreen that I only have to apply once underneath my makeup. I currently use the Boots Once face creme which is a factor 30, could be higher I know but it works for me. I even prefer the Once when I'm on holiday too. I will be taking this away in September though for Mr C to use. Caudalie divine oil: They got the name right for this multi tasking oil. Amazing for your face and body, hair, nails, you name it, you can even pop a few drops in your bath. I've tried many oils on my body and have to say this is truly wonderful. A lot of them promise to nourish the skin without leaving any oily residue but then do. I'm pleased to report this one didn't for me. I massaged it in feeling quite sceptical but was really surprised when it had melted into my skin with just a few rubs and no residue. I hate that feeling when you use a body oil and you're left looking like an oil slick, scared to put your clothes on for fear of ruining your outfit. And the smell............. for me it's holiday in a bottle. Pixi glow tonic: I was really excited to try this one, although the bottle is minute! I'd read lots of great things about this tonic so thought this tiny trial size would be an ideal starting point. I'd been reading about acid toners on various blogs and was intrigued. From what I've read with continued use the glycolic acid in this acts as a gentle exfoliator safely removing the outer layer of dead skin to help bring new fresh skin to the surface. I think this will benefit anyone looking for ingredients that help with anti-aging, that's most definitely ME. It does make your skin tingle, in a nice way and some people have said they got a breakout shortly into using it. Thankfully that's not happened to me. It smells quite fruity in my opinion, it's ok, it's fresh and I like it. My skin is definitely glowing and looks great right now but it's hard for me to say, honestly, that it's down to this tonic as I'm also road testing other skincare products right now so it could be a combination of all of them! I will be buying more though because I love it. Seekers of the sun temporary tattoos: To finish of the goodies in the box are these fun temporary tattoos. Personally I think I'm a bit old for these but who knows I may give them a go on holiday. As I said with no monthly subscription Latest In Beauty are the perfect solution enabling you to try new and exciting products at a fraction of the price. You then know if it's right for you before you splash out. The last box cost just £17.99 plus p&p. If you like a product you can then take advantage of the offers and discounts that come in the box. Win. Win. The first thing I am buying is the Pixi Glow tonic. Have you bought a beauty box recently? Which one is your favourite? Don't forget to keep up to date via Bloglovin.